One of the benefits of writing any type of review for older games is retrospect. I can remember the sheer energy and excitement that revolved around the Nintendo Wii at the time of its launch. People were making very bold claims of how a movement system could vastly change the way we gamed and how much potential there was in such a mechanic. However, I also remember all of that enthusiasm and potential for the system eventually deteriorating into arguments of lost opportunities, lazy control schemes, and accusations of gimmickry. Looking back, it lets us appreciate those few developers that truly made an effort to explore and utilize the system’s capabilities to their fullest while trying to add to the overall play experience of their games. The devs at Retro Studios attempted this very task when transitioning the Metroid Prime series to the Wii. Metroid Prime 3: Corruption is the result of their efforts and it’s definitely one of the most memorable games for the Wii. 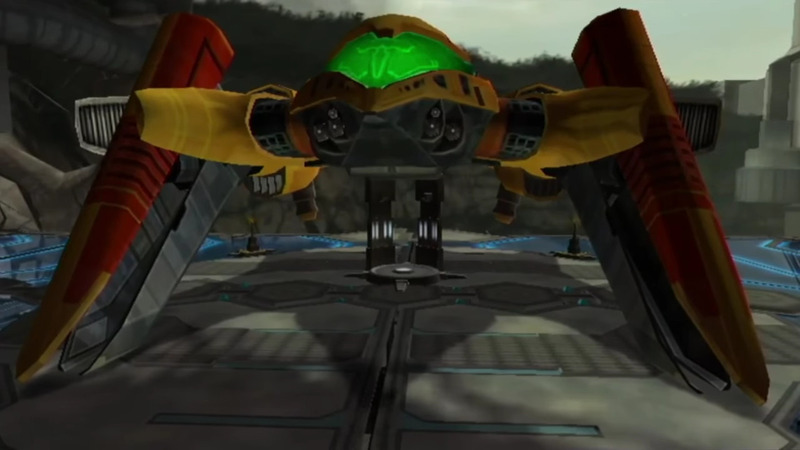 Metroid Prime 3 serves as the epilogue to the series, finally explaining the mysteries behind Phazon, the meteor strikes that precede its presence, and the reveal of the sweeping purpose for it all. 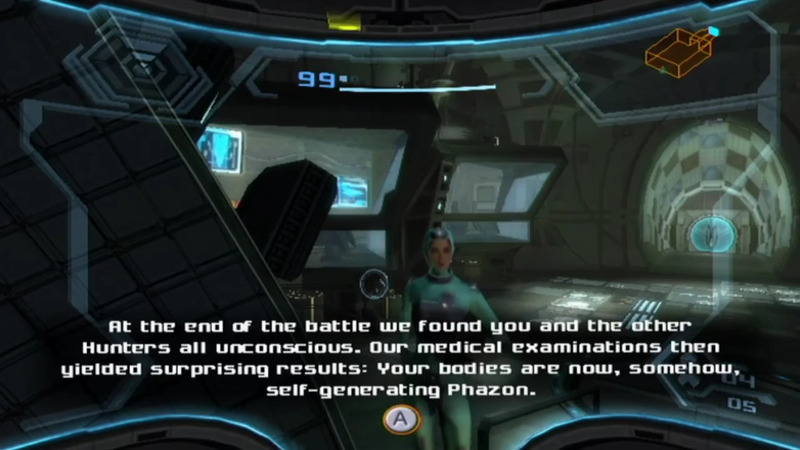 Although it still possesses a galactic presence, Phazon plays a much more personal role in this game, as Samus herself becomes corrupted by it, allotting her new abilities at a heavy cost. The story plays out in familiar fashion as not one, but three planets are impacted by Phazon meteors. While Samus is tasked with saving these worlds and preventing the spread, she also has to face off against Dark Samus, who plays a far more calculated role this time around. 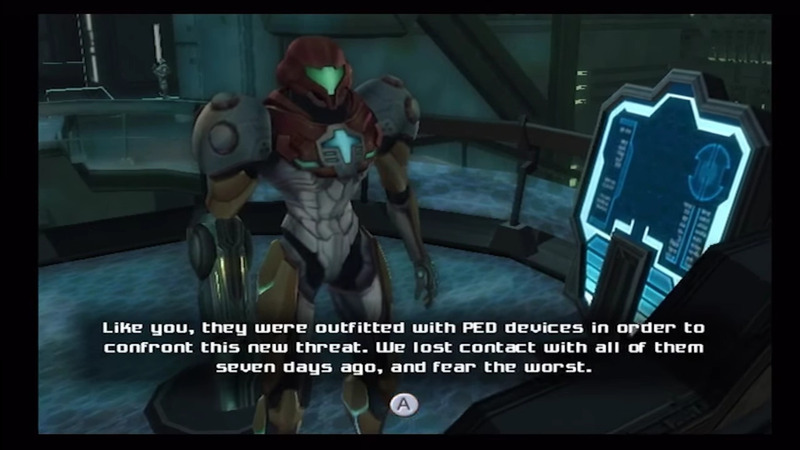 Story elements in previous games (such as symbiosis versus parasitism) are present here, as Samus must learn to wield her Phazon infused powers that are very much a double-edged sword. Should she fail and become corrupted, she will become a literal Dark Samus herself. Since it’s revealed fairly early that multiple planets have been impacted by Phazon meteors, it’s pretty clear that the game progresses over multiple locations rather than a single planet like in the previous two Prime games. Locations such as the Federation base on Norion and the Space Pirate Homeworld are just a few of the areas available to explore during the campaign. In classic Metroid fashion, upgrades dictate the degree to which players will be able to unlock new areas. Acquiring these upgrades will require players to visit multiple systems before progressing. For example, you may find yourself at a dead end on Bryyo, so you travel to Elysia and progress there until you either hit another dead end or find an upgrade that lets you continue back on Bryyo. At times, it’s well executed and the travel between worlds can be appreciated. While this travel system seems like a new concept by the devs, it’s really just a restyling of what we’ve already seen in previous games. Instead of an elevator that takes you to different locations, climates, or facilities on one planet, it’s a ship that takes you to limited locations across systems. I think what I’m most disappointed with is just how limited the areas are within each system. For example, a portion of the game takes place on the Pirate Homeworld. However, instead of an entire planet waiting to be explored, you are restricted to a single facility. On Bryyo, there are only two major locations; the main equatorial area and the minuscule ice portion. One location in particular that irks me is the Valhalla, a wrecked Federation ship. Throughout the game, you have to collect energy cells to access new areas within. It’s a laborious process just to access a handful of rooms that make up the most linear area in the game. Overall, what should have been grand, detailed, fleshed out environments throughout a brimming galaxy are in reality very restricted, condensed zones in a fairly empty cosmos. I almost feel cheated because I was promised the galaxy, but received the smallest overall area of play out of the three Prime games. 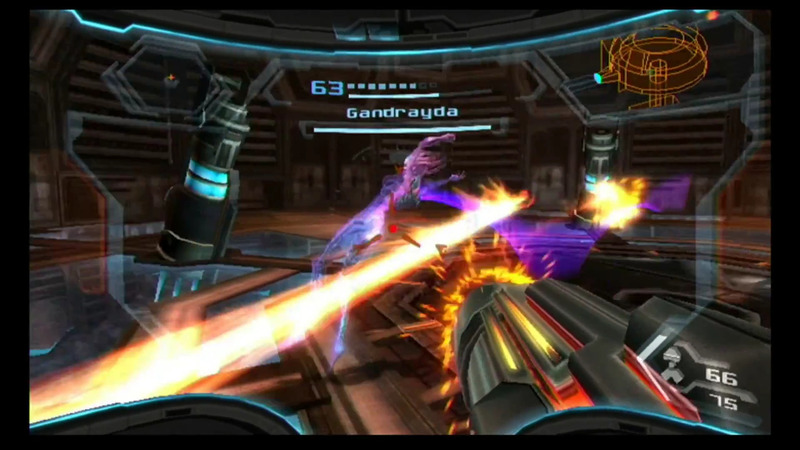 Perhaps a reason for shortcomings elsewhere was the task of integrating Metroid Prime styled gameplay with the Wii remote. With the first Metroid Prime, the devs were faced with the challenge of transitioning Metroid from 2D to 3D and their results were astounding. Not only did they produce a flawless product, there were no sacrifices to other design elements elsewhere. 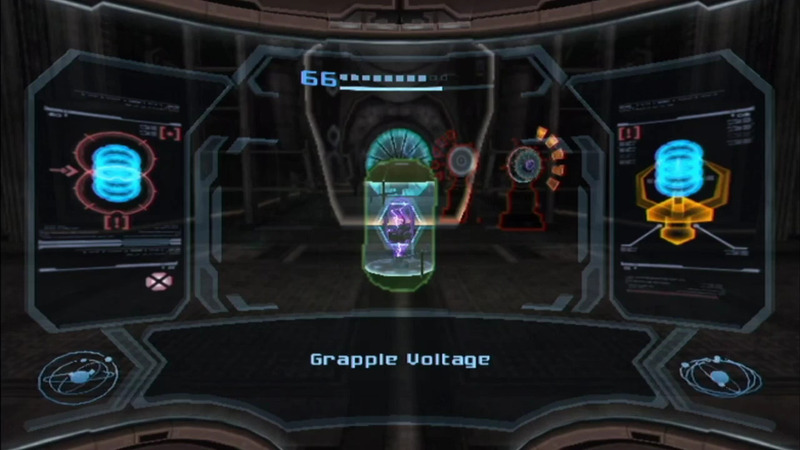 Here, the challenge was transitioning Metroid Prime from traditional controls to incorporating movement. I believe their primary focus was executing this in such a way as to add to the play experience while avoiding tedium. Unfortunately, this transition wasn’t as successfully executed. First though, I’ll go through what did work. As always, combat is paramount and here, it worked. Using the Wii remote to aim the beam cannon is a logical choice and having the ability to adjust sensitivity helps. The lock-on can be set to free aim, meaning that while locked onto a target, you can still aim and fire elsewhere. Personally, I kept this off, as I preferred the original lock-on style, but having that option is a nice touch. Other combat elements, such as using the grapple items to pull shields off of enemies and drain their energy also works incredibly well and feels natural. You don’t need to think about how to move or which buttons to press, the controls allow for a smooth flow during a fight. It’s here that the motion controls truly shine. Outside of combat is another story. While I understand the reasons for what the devs tried to do, I feel that their efforts to integrate motion elsewhere fell completely flat. In previous games, activating switches or opening doors was done with one, maybe two button presses. Also, those areas in MP1 and MP2 that required puzzles were consistently well executed and never got to the point of annoying. Here, it’s sometimes a series of movements to manipulate handles, such as pulls, pushes, and slides. Again, I understand why they tried to incorporate this, but there was no need to reinvent the wheel (or door, switch, etc…). While some of the efforts did pay off, for example I was impressed with the welding mini games to repair circuit boards, those successes were far too few. The major reason I deem it unsuccessful is because of the breaks in game flow. You literally have to stop to interact with these levers or handles. Previous methods to opening or activating worked well because they didn’t break flow. They were quick and easy or involved puzzles that were immersive and challenging enough that they didn’t break flow nor create tedium. Here, you are forced to walk up to the interaction point, allow the game to zoom and adjust you into place, and then you can perform the needed movements. It becomes extra, unnecessary fluff that takes the movement into gimmick territory and it only hurts the experience. Fortunately, the attention to detail when it came to aesthetics was not lacking. I think the visuals and audio of Metroid Prime 3 are some of the most impressive out of all the Metroid games. The voice acting was well executed, as they gave voice to an array of characters and it allowed a depth of personality rarely seen in Metroid. They also kept our stalwart hero silent, an extremely good choice by these devs. The themes for each character were impressive, as each track very nicely fits the personality of the character they represent. For example, the solid, punctual beat throughout Rundas’s themes fit his strength and confidence. Or with the Gandrayda battle theme, the combination of allegro throughout with the constant play of crescendo and diminuendo match nicely with her shapeshifting, nimbleness, and acrobatic style of combat. The visuals are just as impressive as the audio, as the backgrounds and level designs are full of detail and purpose. Norion is clean cut and technologically stark, representing the militaristic nature of the Federation. Bryyo is a fusion of organic and stone, demonstrating the species’ symbiosis with its environment and their similarities to the Chozo. Like in the previous two games, the visuals tell stories of their own, whether it’s the history before the Phazon impacts or the corruption that’s rapidly spreading. I only wish I could explore these vivid environments even more. The aesthetics are once again on point and absolutely incredible. Metroid Prime 3 has its shortcomings and if the transition to the Wii wasn’t a factor, perhaps we would have seen more of what made MP1 and MP2 so great. 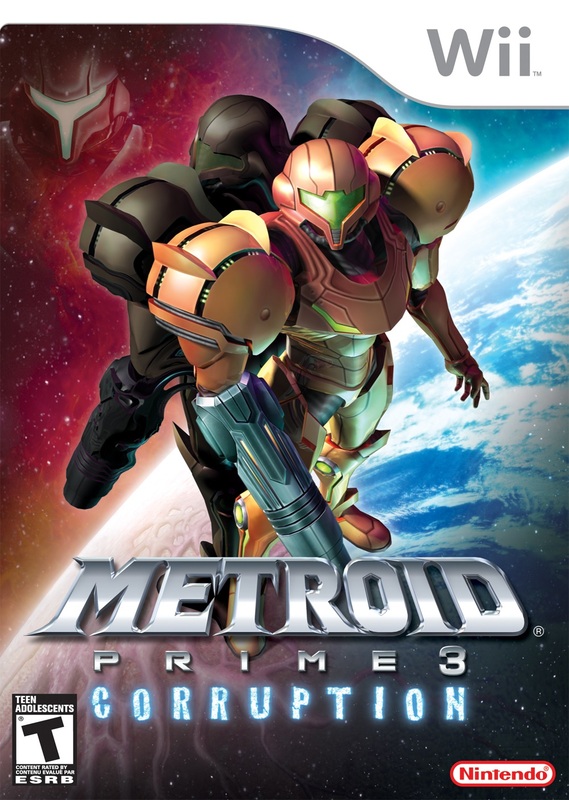 It’s unfortunate that some of that Prime magic was lost this time around, however, Metroid Prime 3 is still an excellent game that holds up on its own. Despite its pros and cons, Metroid Prime 3 has it where it counts, with solid, challenging combat and a story worthy to conclude the series. It’s definitely one of the brightest spots for the Wii and an acceptable addition to the Metroid series.